Around 2004, I began researching a new book. I hoped to find out whether my hunch that much of the language of cyberspace drew from nature metaphors was correct and then, if I was right, to explain why. It would be nine years before the book was published, and most of that was spent in frustrated confusion. It was easy to show the first – we’re surrounded by nature metaphors online, from surfing to spiders to clouds, and many other examples. But the reason why? I had no idea. It wasn’t until I came across the biologist E.O.Wilson’s book Biophilia that it all began to click into place. The result, eventually, was a new word – ‘technobiophilia’, meaning “the innate attraction to life and lifelike processes as they appear in technology”. And now, slowly, it’s giving rise to a new area of study. I get emails from people around the world who have come across my book and recognised what it describes. Many of them are working to put technobiophilia into practice. In the meantime, more examples cascade into my stream (yes, more metaphors!) every day. This website is designed to catch and share them as they float by. For a full account of the research behind Technobiophilia: Nature and Cyberspace , and to understand how I got to it, you’ll need to read the whole book. 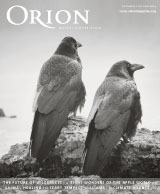 This month I have a short essay, ‘Another Ocean’, in Orion, a long-established and beautifully-produced American magazine about nature and the environment. I’m very grateful to the editors for taking a chance on a piece about the internet and the sea because I realize that it’s a synergy which may not sit comfortably with some readers. I do hope they like it though. Unfortunately ‘Another Ocean’ is in the paid-for section of the magazine but perhaps that’s a good opportunity to sign up for a free trial issue! I’ve been reading it for years and always enjoy the great writing and gorgeous images.